We pay special attention to developing independent thinking with excellent speaking and listening skills to support their learning in every part of the curriculum. We differentiate our teaching in order that all children gain access to the learning. All teaching takes into account the different abilities and maturities of the children. Every class has daily access to Teaching Assistants who provide individual and small group support. Teachers use a range of teaching styles and strategies. They ensure their teaching supports visual, auditory and kinaesthetic learners (i.e. children who learn better by ‘doing’).The children work in a variety of ways including whole class teaching, group or pair work, individual teaching, collaborative learning and ‘circle time’. We aim to work with the children to build a toolbox of thinking strategies which will promote success in their learning. To help the children develop a positive approach to learning we teach Habits of Mind such as persevering, communication with clarity and striving for accuracy. Hyerle's Mind Maps are a set of visual tools we use for organising ideas and information. De Bono's 6 Thinking Hats helps the children to think in different ways for different tasks. Philosophy for Children develops a community of enquiry where questions are valued and explored. We make sure there are opportunities for developing the skills, processes and concepts necessary for active learning to take place. This includes practical, investigative, oral, written and problem solving activities. We also use a wide variety of resources, for example, parents/carers, other adults, computers, books, videos and interactive whiteboards, etc. Teachers are continually monitoring every child’s progress. Targets are set with the children and by the teacher. Progress is monitored and shared with parents/carers and we immediately share any concerns about a child. Teachers' planning ensures that high achieving children are challenged and extended. We also encourage children who show ability in other areas of the curriculum, for example, creativity, thinking skills, PE, music etc. We have a homework policy which progresses from nursery through to Year 2. In order to support the teaching of reading, parents/carers are expected to share a variety of books with their child every night. There are short activities to complete at home for numeracy. We have a school council with pupils from Years 1 and 2. We try to ensure that everyone in our community can participate in all aspects of school life. Outings are organised for each year group as a way of enhancing learning in different areas of the curriculum. The commitment of staff and parents working in partnership helps to make these events a success. 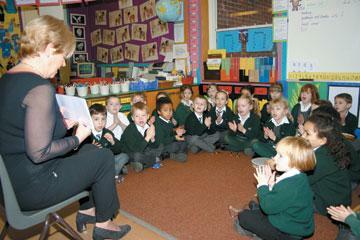 A variety of visitors are invited to the school to extend areas of the curriculum. These include theatre groups, dancers, musicians, authors and artists who either give performances or help the children gain access to their art.